Fall is in full swing as the lovely smell of decaying leaves fills the air. I'm constantly trying to come up with new desserts that celebrate fall, but I usually end up baking endless amounts of pumpkin bread. Now, you won't hear any complaints from me as I love pumpkin bread. 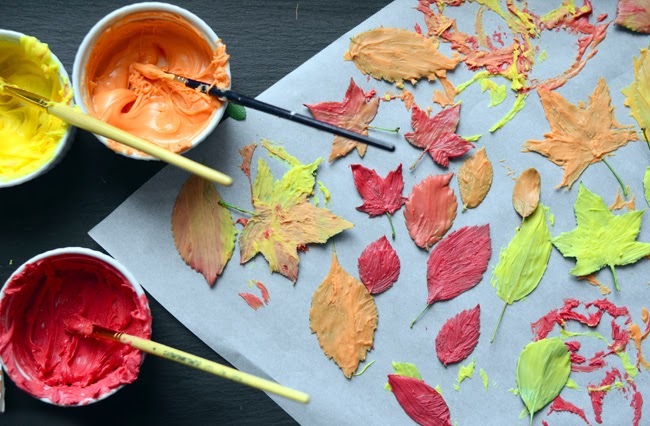 But, this time I really wanted to replicate the seasonal falling leaves. 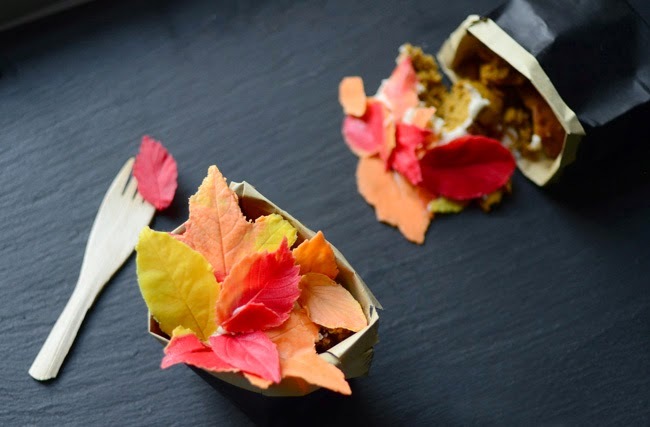 These "bags" of leaves don't get much cuter (they certainly don't get any tastier!) They're filled with pumpkin muffins, a caramel buttercream and topped with white chocolate leaves. I use the term "muffin" loosely. It's basically a cupcake, seeing as we're topping them with frosting. They are a little less sweet and have no butter. Dare I say it...they're healthier than cake! 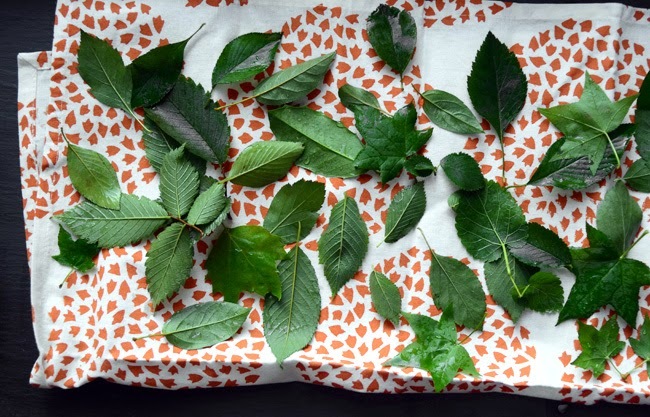 The best part about creating this dessert was taking a long stroll in the park with Nolan to collect the leaves. (The smell of that pumpkin pie spice baking in the oven comes in as a close second.) 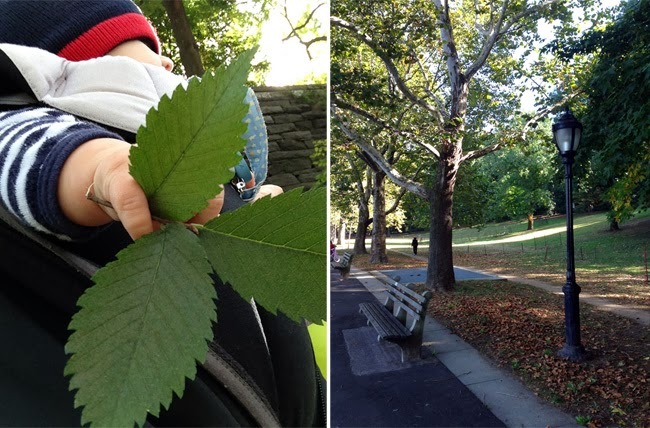 Look at all the great leaves I found in Riverside Park! Now, these need a thorough wash to rid them of the NYC grime we all love so much. 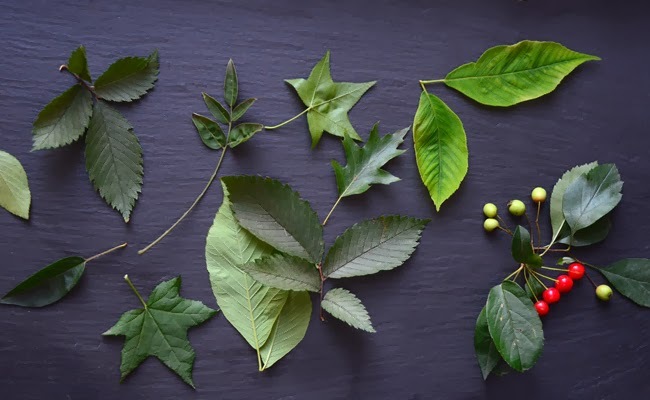 Make sure your leaves are fresh and flexible. You don't want any leaves crumbling on you. 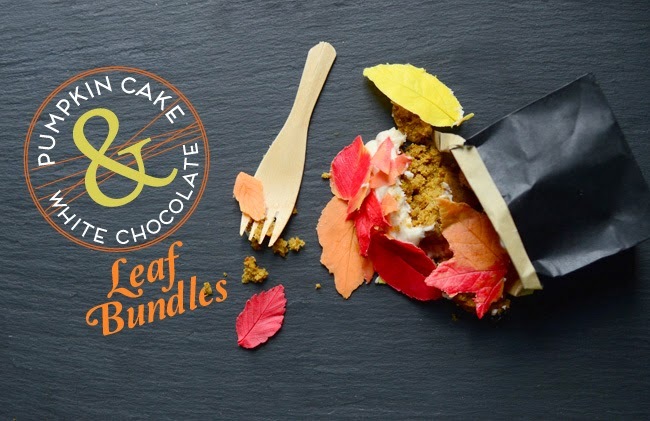 The first thing you want to create is the white chocolate leaves. They are incredibly easy to make and stunning to look at. 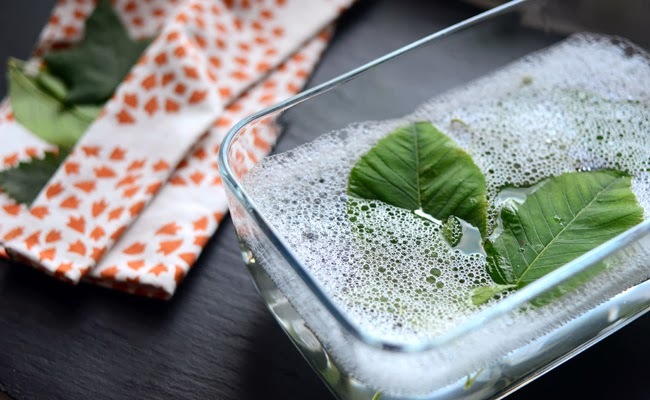 Clean the leaves in bowl filled with warm water and mild soap. Lay out on a clean towel to dry completely. 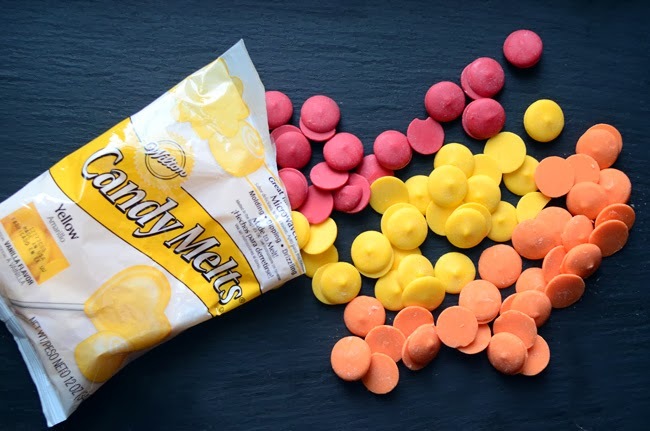 Melt the candy melts according to the package directions. 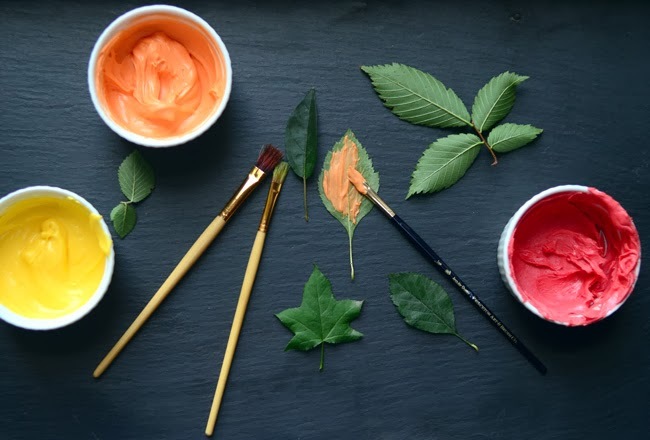 Paint the chocolate on the underside of the leaf, making sure to get a thick coating. Let chocolate harden in a cool, dry place or in the refrigerator. 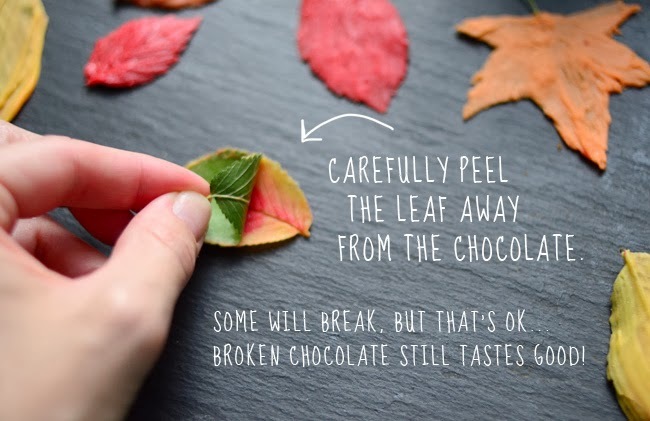 When the chocolate is fully hardened (at least 2 hours), carefully peel away the leaf from the chocolate. 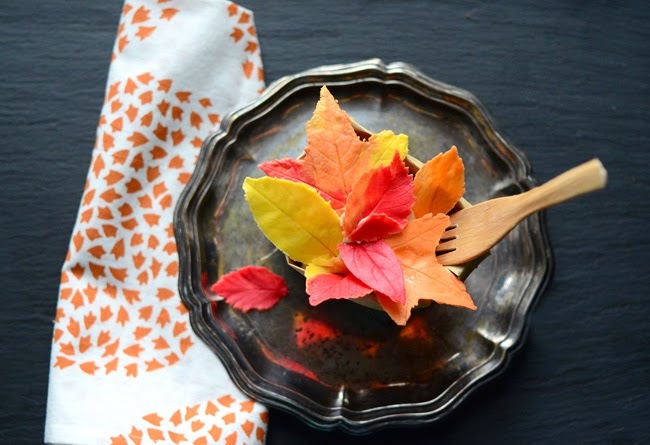 Leaves can be made days in advance, just store in an airtight container in a cool, dry place. Then make the pumpkin muffins and caramel buttercream frosting. 1. 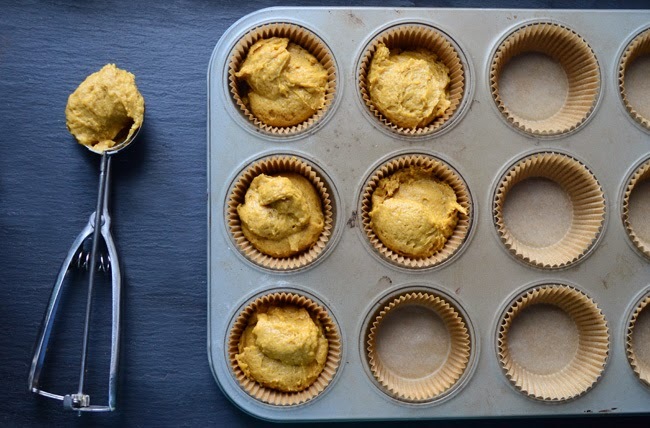 Preheat the oven to 350 degrees and line a 12-cup muffin tin. 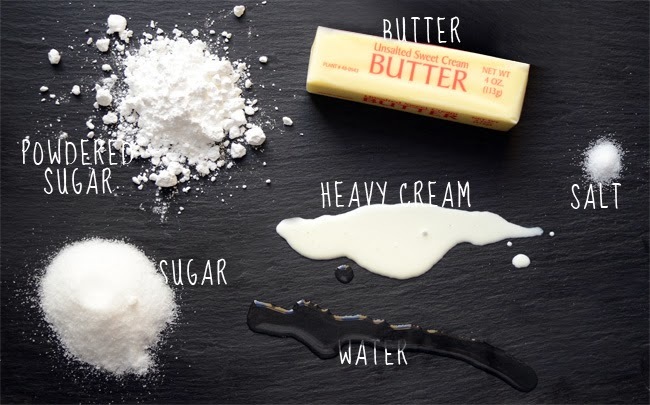 In a medium bowl, whisk together the flour, spice mix, baking soda, baking powder and salt. 2. Using an electric mixer, beat the pumpkin with the eggs, brown sugar and oil. Carefully mix in the dry ingredients until evenly incorporated. 3. 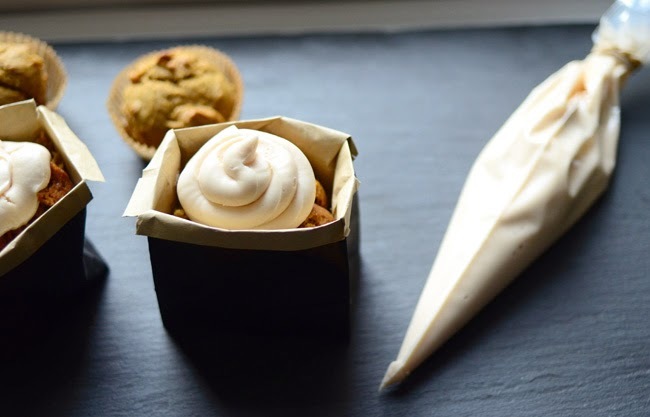 Use an ice cream scoop to fill the prepared muffin cups. 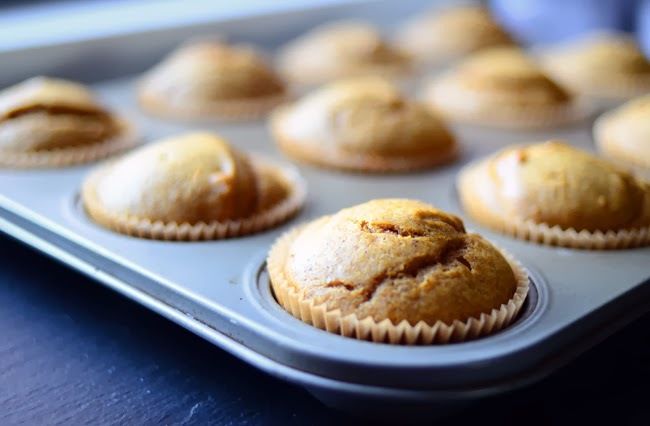 Bake for 18 minutes, or until a toothpick inserted in the center of the muffins comes out clean. Let the muffins cool before assembling the "bags". Muffins will keep for up to 3 days in an airtight container. 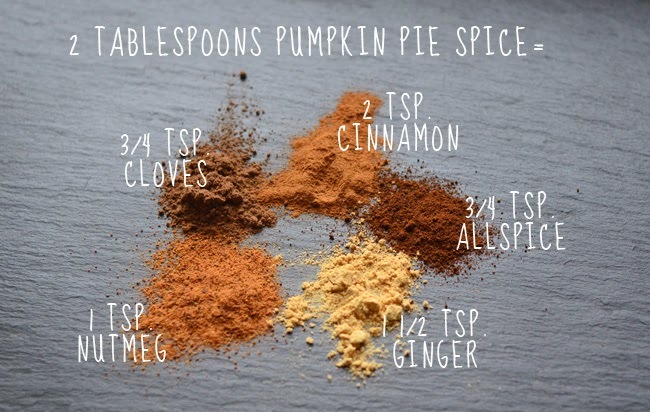 Make your own pumpkin pie spice!! 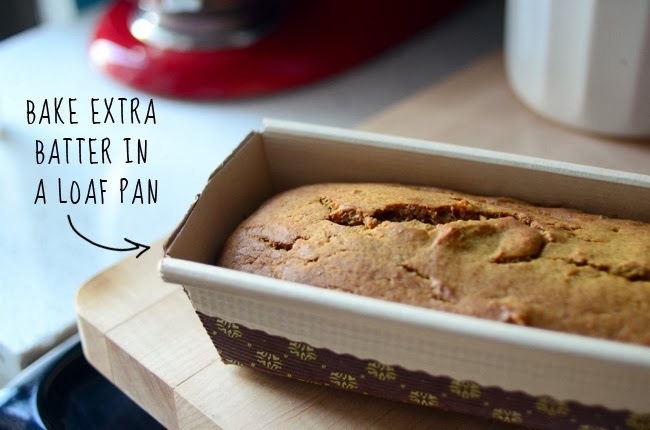 You could always bake the batter off in loaf pans instead of muffin tins. 1. 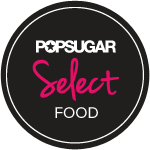 Stir together sugar and water in a small saucepan and bring to a boil over medium-high heat. Continue to boil until mixture turns amber in color, about 7 minutes. 2. Turn off the heat and slowly add 1/2 cup of cream, stirring until completely smooth. (It will bubble, so be careful.) Set aside and let caramel cool. 3. 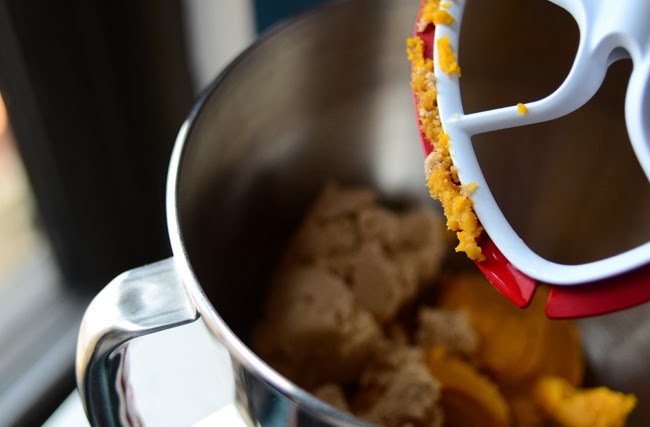 Beat butter in the bowl of a stand mixer fitted with the paddle attachment on medium-high speed until light and fluffy. Reduce speed to low and slowly add powdered sugar and remaining 4 tablespoons of cream. Add in salt and beat until fulling incorporated. 4. 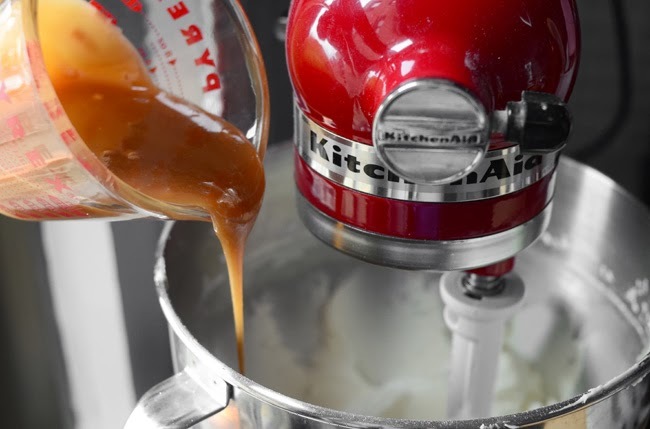 Scrape down the sides of the bowl, then add caramel. Beat on medium-high speed until frosting is desired consistency. Add more cream if the frosting is too thick. 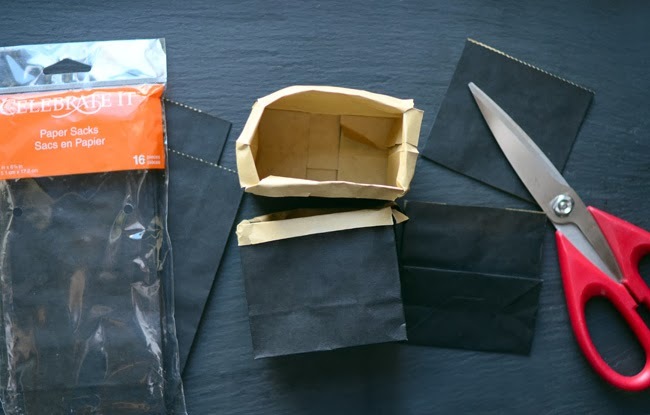 Cut off the top of the paper bags and fold edges down about 1/4". I used small "Celebrate It" bags from Michael's but you can probably use any party-favor-size bag. 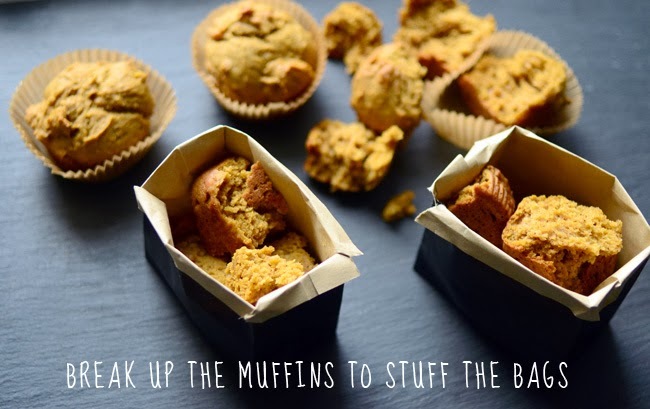 Break up muffins into large pieces and fill bags 3/4 full. Top with a dollop of caramel frosting and assemble assorted white chocolate leaves on top. 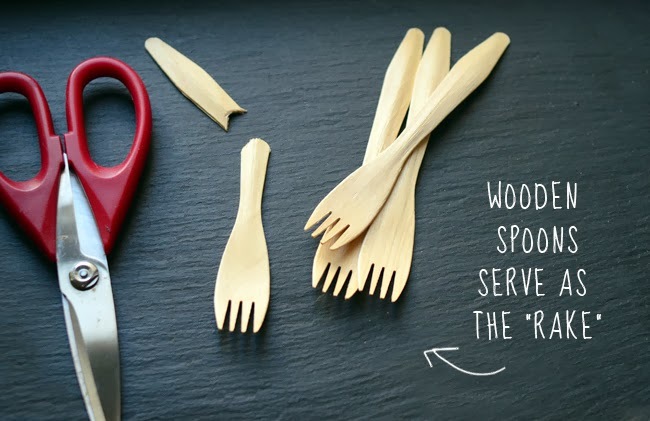 If you can find wooden forks, they add a nice rustic touch–plus, they're really cute. I love the chocolate leaves. Thank you for sharing such a cool trick! I can't wait to make some! 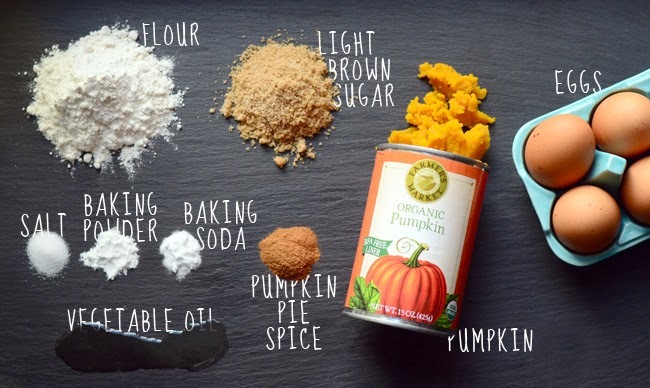 And those pumpkin muffins... Oh, I would love to eat them all.